Pioneering art therapist Sadie Ellis Garland Dreikurs (1900-1996) used self-expression through painting and drawing as a means of modifying behavior, life-styles, and personality patterns. Sadie Ellis (born Sarah Ellis), who grew up on the Near West Side of Chicago, later reported that her interest in art began at the age of six when a teacher demanded that she change a drawing she had made of a purple cow. At 11, when visiting the Hull-House settlement house with a friend, art teacher Emily Edwards was impressed by Sadie's sketching and introduced her to the settlement's extensive art program. Sadie took art classes at Hull-House and attended the School of the Art Institute of Chicago on a scholarship obtained with Edward's assistance. She was forced to quit her studies however when her father's business failed. She continued, however, to attend art classes at the settlement house. At Hull-House, Sadie met her future husband, artist and teacher Leon Garland (1896-. After their marriage, the two left to travel in France, Germany, Switzerland, Lithuania, and Italy and study with Andre L'Hote in Paris. The Garlands returned to Hull-House to live in a studio apartment atop the Hull-House buildings. Both taught classes in the Hull-House art school and exhibited in the city and internationally. They experimented with a variety of subjects and styles, including cubism. At Hull-House, Sadie became director of community services and volunteered to work with a group of "delinquent" boys. She gained their attention and interest by having them do group pictures on huge sheets of wrapping paper taped to the Hull-House walls. These early experiments with group painting to change behavior began Sadie's career in art therapy. After Leon Garland's death in 1941, she married Rudolph Dreikurs, an Adlerian psychologist and began to develop art therapy methods based on Adlerian principles. She assisted Dreikurs in his writing and teaching and they traveled extensively to organize psychiatric clinics and conduct hospital staff orientations. 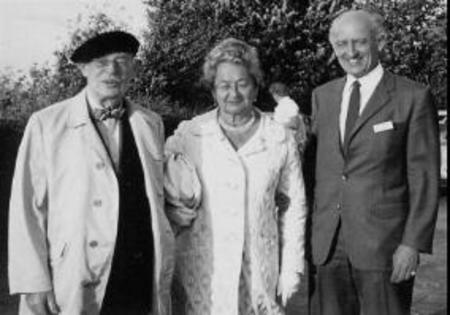 Sadie continued to write and teach at the Adler Institute when she was well into her 80s. In 1986 she published the book Cows Can Be Purple: My Life and Art Therapy. In 1987, Mayor Harold Washington named her to Chicago's Senior Hall of Fame. In 1986, Sadie “Tee” Dreikurs was interviewed on video about her life and career. The resulting two-part documentary movie premiered at the first annual Founder’s Day at the Alfred Adler Institute of Chicago, February 8, 1987 to great acclaim. (It won a Chicago International Film Festival Certificate of Merit in 1987). It is an engaging companion piece to her book, Cows Can Be Purple, published in the same year. The video was subsequently sold to libraries, schools, and individuals. NASAP and the Alfred Adler Institute of Chicago (now Adler University) were co-sponsors of this production. Tee’s personal accomplishments as an artist and fascinating connection to Jane Addams and Hull House, and then her Adlerian career as Rudolf Dreikurs’ wife and collaborator form the two parts of the movie. The movie’s sample enactment of Tee’s invention of Adlerian Art Therapy, with her extensive commentary, has been in use in psychology graduate classrooms. Now, after over thirty years, the video has been digitized and is ready for even wider circulation.